Uses: A tea is made from the leaves and the roots. The aromatic root is candied and used as a masticator. Notes: The plant prefers acid, neutral and basic (alkaline) soils. It can grow in full shade (deep woodland) or semi-shade (light woodland). It requires moist soil. Best is sown in the Fall or Winter. Shipped during November and March. Ginseng is said to be highly good for the metabolism, and promotes general well being. It has a reputation as an aphrodisiac, but this seems to be totally based on the fact that it relaxes the overly tense person a bit. If you suffer from back pain or T.M.J. adding this to a tea of Catnip and slippery elm may help. It is also presumably useable as an ingredient in a meade or magewine. Order and sow in the Fall or Winter. Looking for Where to Buy Ginseng? You are at the right place! EXTRA NOTES: Order stratified American ginseng seeds online here! Whenever buying ginseng seeds, make Sand Mountain Herbs.com your herb seed company of choice! If you have any questions about growing ginseng, be sure to ask us. We have worked with ginseng for over 30 years now, starting with the wild plants to simulated woods grown to potted ginseng. We have tried it all with great success. We definitely know how to plant ginseng seeds effectively for home use or for the open ginseng market. We are offering stratified American ginseng seed for sale online here! Growing ginseng is easy, but you have to do your plantings the right way. We are here to help you get the best results with planting ginseng from seed. The biggest thing to remember is that when growing ginseng, you need to remember that it is a woodlands plant that loves the shade. So if you can replicate the natural woodland plants growing conditions that ginseng thrives in, then you will definitely be successful. 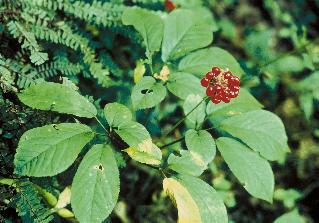 Fall planted ginseng seed does the best in moist shady conditions, and will germinate in the spring. Most people want ginseng for the roots, however Panax quinquefolius does make a beautifully interesting plant as well with a nice red cluster of berries in the fall. The plant is certainly a conversation piece for your herb garden or landscape. This plants forked root and leaves are cherished for its use in Chinese medicine. This is why the root is so highly valued. It is not uncommon to sell ginseng roots at $400 or more per pound, but the prices vary from year to year depending on the Chinese ginseng buying market. Ginseng root in herbal applications is said to be a natural energy booster, immune system strengthener, and homeopathic stress reliever. What is ginseng? Panax quinquefolius is a perennial herb that usually is found in deciduous forests of the eastern United States. It is becoming harder to find due to over harvesting in some areas, but it is still thriving in the wild. There are many benefits of ginseng so be sure to check them out. Sand Mountain Herbs: We mail ginseng seed worldwide. Order with confidence using Paypal or simply mail us a check with the order form. We will ship asap.